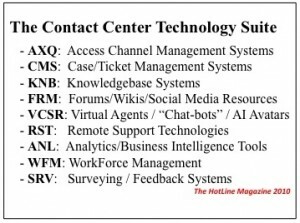 The process whereby a company selects contact center technology tools, such as a case management system, is clearly broken. This is not a secret, it’s been obvious for many years. Typically, a prospect throws together an RFP, Request for Proposal, often roughly combining drafts from several sources out on the Net, and sends it off to fifteen or twenty different CMS manufacturers. At best, 5 to 8 of the recipients will send back either an equally rough boilerplate form or some level of reasoned response, and the sales campaign will begin. When will the real decision makers reveal themselves? Which company will offer the deepest discount? Which sales team will be best at capturing all of the available bandwidth of the support team? And after all the furor is over, which surprise ending will be the final result? The deck is stacked against success. The functionality that is most needed, that would help centers to be run effectively and profitably — and their customers to be properly served, is not even being offered. Often the best of what is available in tactical functionality won’t be considered, for the manufacturer didn’t respond to the RFP in time or at all. And the final decision is all but certain to be made for reasons that have nothing to do with the true strategic and operational needs of the customer contact center. A major part of what brought us to this scenario is the bloatware race between the software manufacturers, the contest to see who can add the most “features” to an already overloaded package. Most of this functionality will never be used by the contact center employees; if it’s ever even implemented, it will be turned off after a short trial. Another significant factor is that the driver at the company end is the sales management team, who have eyes only for getting a “CRM” system to handle Sales Force Automation — so long as the system supposedly has a service module, that’s good enough. And when the support center team is able to provide input on what the system should do, the focus is only on tactical aspects of case management. It’s time for a change, a new approach. Get rid of the massive RFP’s that no one has the time to deal with anyway. Give the customer support technology manufacturers a chance to compete by offering the functionality that can truly make a difference in the industry. I’m working with a group of manufacturers and contact center professionals to design and implement a better way to approach customer contact center management technology, one that will be profitability driven and enable authentic customer centricity. If you’re interested in being a part of that effort, give me a call. Otherwise, stay tuned.